The 2015 Washington State Championship / Premier / Invitational chess tournaments were conducted as round-robins the weekends of February 7-8 and 14-16, 2015 in Seattle as detailed below. Rounds began at 10:00 AM and 5:00 PM on the weekends, and at 5:00 PM on President's Day, Monday, February 16. 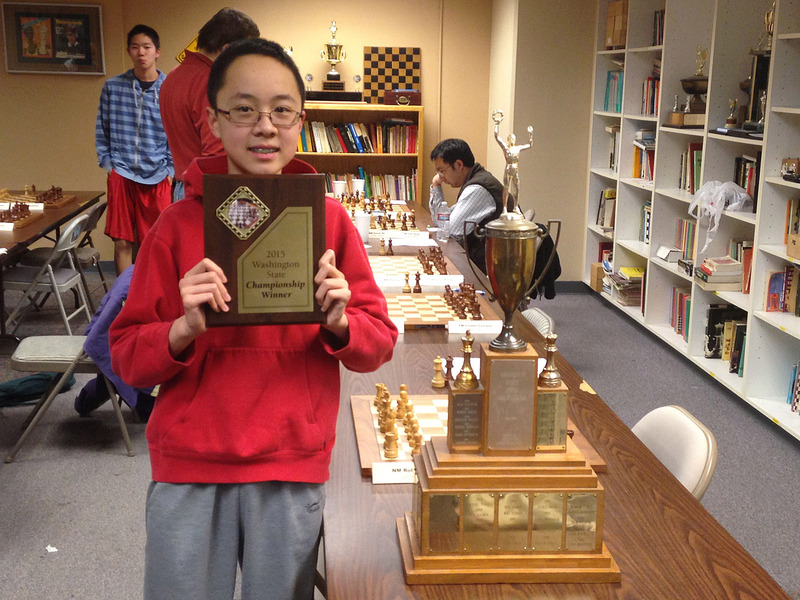 Congratulations to Washington State chess champion Roland Feng! Roland Feng recently became Washington's youngest ever State Chess Champion (14 years, 16 weeks, 2 days) on Monday, February 16. He scored 6.5/9 to take clear first in the 10-player round-robin held during the first two weekends in February at the Seattle Chess Club. As a result of this strong performance, Roland's FIDE rating has climbed to 2322, for which he is now a "FM (FIDE Master) elect," and should be awarded the official FM title soon! Over the course of nine rounds, Roland was undefeated and scored victories against FM David Bragg (2200), LM Viktors Pupols (2200), NM Samuel He (2227), and FM Curt Collyer (2313). Congratulations Roland! - Reported by WCF President Josh Sinanan. Photo: Roland poses with the championship trophy and award plaque. PGN file of games! (Includes all sections and rounds) | USCF crosstables link. See the blog post (including photo of Roland Feng) by WCF President Josh Sinanan. Format: Three invitation-only 10-player Round Robins by rating: Championship, Premier, and Invitational. The field of each section was determined by seeding and by the highest rated players to respond to an invitation based on the January 2015 USCF rating list. All sections were dual USCF and FIDE rated. Fred Kleist was the TD for all three sections. Time control: 40/2, SD/1 with a 5-second delay. Boards and sets are provided at the tournament, but not clocks. Schedule: Rounds 1-8: Feb. 7, 8, 14, 15 at 10:00 AM and 5:00 PM. Round 9: Feb. 16 (President's Day) at 5:00 PM. Site: Seattle Chess Club, 2150 N 107 St. Seattle, WA 98133. Prize Fund: The initial prize fund for each section is guaranteed by the WCF, and will be increased based on donations. Championship: $1,500 (increased to $3,200), Premier: $1,000, Invitational: $500. Prize distribution (each section): 1st 45%, 2nd 25%, 3rd 15%, 4th 10%, 5th 5%. Brilliancy Prizes: $300 ($100 for best game in each section). The winner of the Championship section receives the title of Washington State Champion. Drawing of lots: Feb. 1st at 12 noon at Northgate Mall food court. Attendance was optional, though encouraged. Byes: Since this is a prestigious round robin, there will be no half-points byes or rescheduling of games allowed in any of the sections. All games must be played at SCC at the scheduled round times. Championship: NM Nat Koons (State Champion), NM Roland Feng (Open Champion), FM Curt Collyer (Challenger's Cup Champion), FM Bill Schill (Premier Champion), NM Daniel He (Championship Runner-up and Junior Closed Champion). Premier: NM Michael MacGregor (Premier Runner-up), Anath Gottumukkala (Junior Open Champion). Invitational: LM Viktors Pupols (Senior Champion) - qualified for championship section instead based on rating. Registration: Invited players please register online via online registration, or reply to the email you received. Note: registration is now complete and the fields are set! Questions? Josh Sinanan, WCF President, (206) 769-3757, joshsinanan@gmail.com. Brilliancy prizes - Championship: Roland Feng $100 and Costin Cozianu $100 are co-winners for their wins against Collyer and D. He, respectively. Premier: Kevin Gafni $100 for his win over James Colasurdo. Invitational: Alan Bishop $100 for his win over Ryan Ackerman. Details will be published in the magazine. Here are the fields of the Championship, Premier and Invitational sections. Update (2/6): Unfortunately the defending State Champion Nat Koons had to withdraw from the Championship section at the last minute due to a scheduling conflict. Please note that Bragg has replaced Koons in the Championship, Colasurdo has replaced Bragg in the Premier, and Olson has replaced Colasurdo in the Invitational. The winner of the Championship section receives the title of Washington State Champion. 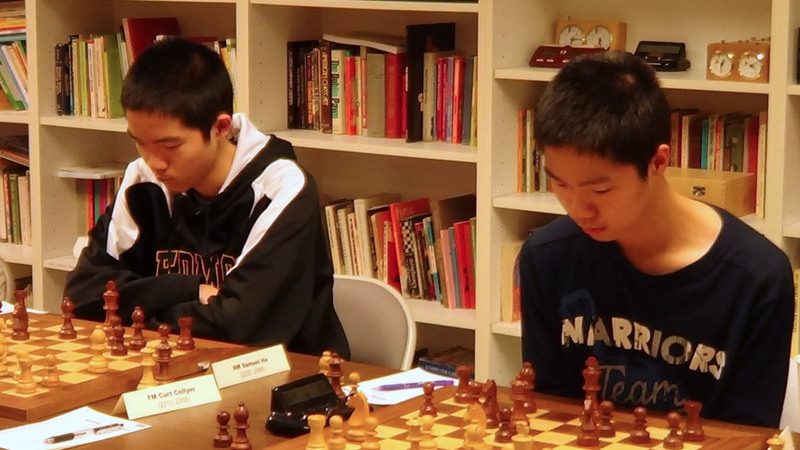 Photo: The He brothers, Samuel and Daniel, both National Masters, compete in the state championship. The winner of the Premier section qualifies for the next state championship tournament. The winner of the Invitational section qualifies for the next state premier tournament. We kindly ask that each player in the Championship/Premier send a brief bio with picture for publication in the March issue of Northwest Chess. Please arrive by 9:45 a.m. on Saturday morning (2/7) before the first round. The group photos for both sections will be taken on Sunday 2/15 at 4:30 p.m. prior to round 8. Please dress nicely! We ask that prize winners please annotate at least one game for Northwest Chess magazine. Pairings will be released after the drawing of lots. Here is the pairings schedule for the rounds in each section. This is from the Berger tables. See the cross tables below for the players corresponding to each pairing number. The Championship has been registered and will be FIDE rated. Titles: FM = FIDE Master, NM = USCF National Master, LM = USCF Life Master. Latest pre-tournament USCF ratings shown below. Congratulations to Premier champion Derek Zhang! The Premier has been registered and will be FIDE rated. Congratulations to Invitational champion Chouchanik Airapetian! The Invitational has been registered and will be FIDE rated. Organizers: Josh Sinanan (WCF President). Thank you for your service to chess in Washington State. Look for a full report in the April issue of NORTHWEST CHESS, which should be in subscriber's hands by early April. For subscription information, please see our magazine info page. 2014 | 2013 | 2012 | 2011 | 2010 | 2009 | 2008 | 2007 | 2006 | 2005 | 2004. Previous WA chess championships: List of winners (includes links to event summary pages).